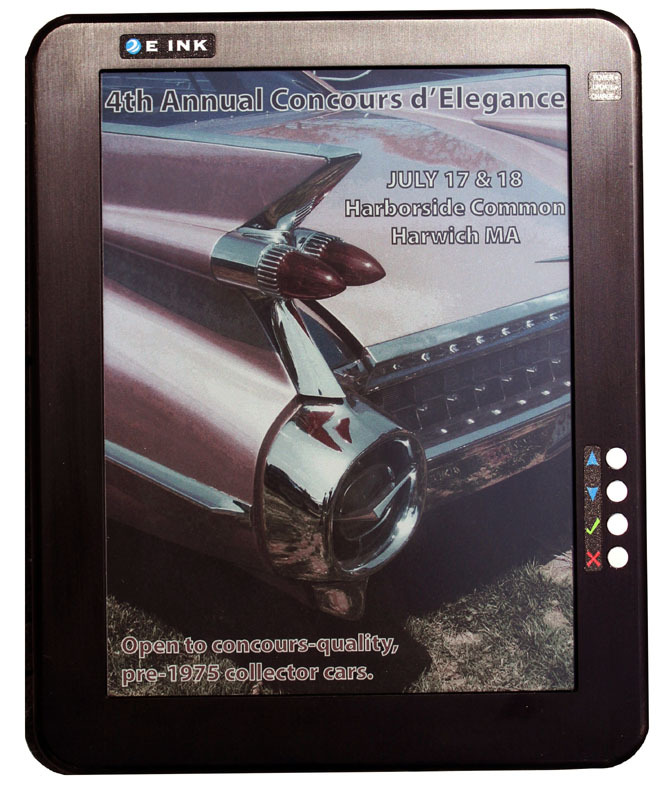 Electronic paper display makers E Ink has unveiled E Ink Triton, a new color electronic paper display that can handle the 16 levels of grey found in current ereader displays, as well as “thousands” of colors, with both text and colors readable in direct sunlight. What’s more, E Ink claims its new Triton color epaper displays are up to 20 percent faster than previous E Ink displays, making page-turns and rendering even more usable. And the first product to sport the color E Ink display isn’t the Amazon Kindle, Sony Reader, Barnes & Noble Nook, or another ereader in consumer channels angling for holiday gift-giving dollars: it’s an ereader from Hanvon, makers of the Wisereader. The Triton color epaper is a reflective electrophoretic display that can handle images with 4 bits of depth for a total of 4,096 colors, plus the same 16 levels of grey existing E Ink monochrome displays can handle—and, like those displays, Triton holds its image even when the power is off. Triton is still slow compared to conventional displays: E Ink says Triton can take from just under a quarter second to almost a full second to update (depending on the image). And while the display is readable in direct sunlight and has a viewing angle of virtually 180 degrees, it offers a scant 10:1 contrast ratio. E Ink’s Triton displays aren’t going to be earning it any friends in the high-end photography or gaming communities, but for electronic publishers eager to get maps, graphics, charts, graphs, comics and (of course) advertising into the burgeoning ebook market, the Triton displays will be a godsend. E Ink says it can make displays with resolutions in excess of 200 dpi at sizes ranging from 2 to 12 inches—E Ink isn’t just looking at ereaders, but at wireless devices, game controllers, industrial displays, point-of-sale systems, signage, and things like thermostats. E Ink doesn’t manufacture ereaders—it just supplies displays to ereader makers—and pricing and availability information isn’t available yet for the Hanvon ereader with the Triton display. However, expect color ereaders to start hitting the market in the next few months. Of course, not all ereader manufacturers have been waiting for E Ink to bring color to the table: Apple’s iPad tablet uses an LCD display, and Barnes &s Noble just announced a, LCD-based color version of its Nook ereader. E Ink’s Triton can’t offer the same levels of contrast or color fidelity as LCDs, but it also doesn’t consume anywhere near as much power—and for portable devices, battery life is everything.